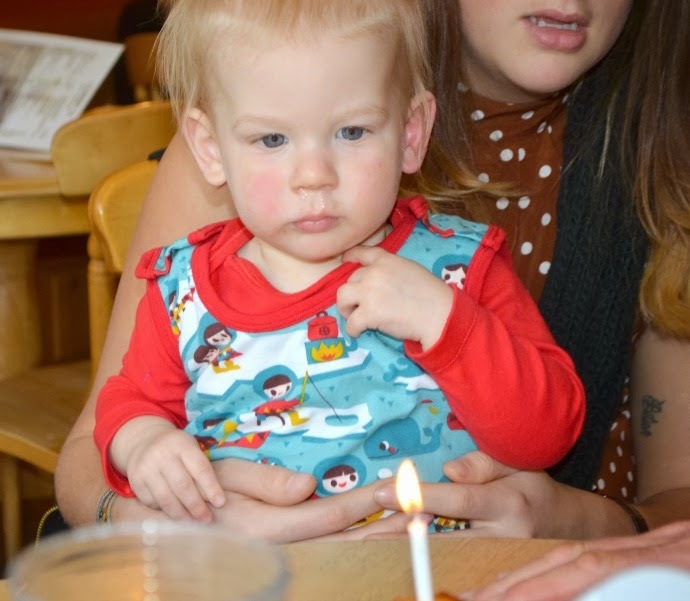 On the 17th of February the littlest dude turned one! I still can't work out how a whole year has passed, but it has. 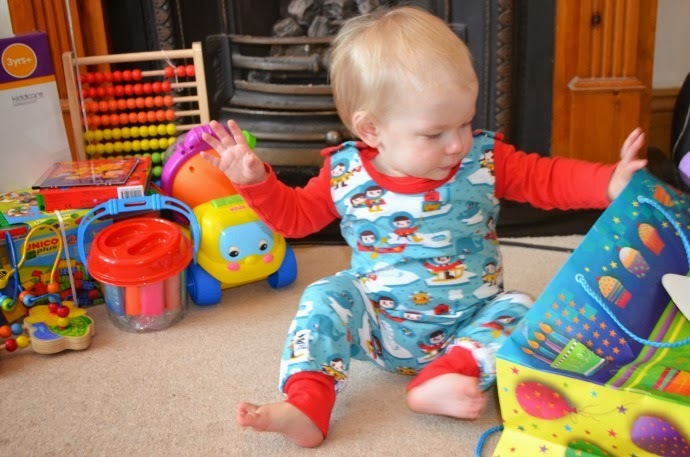 At 12 months, Archie is leaving behind the baby days, but isn't quite a toddler. 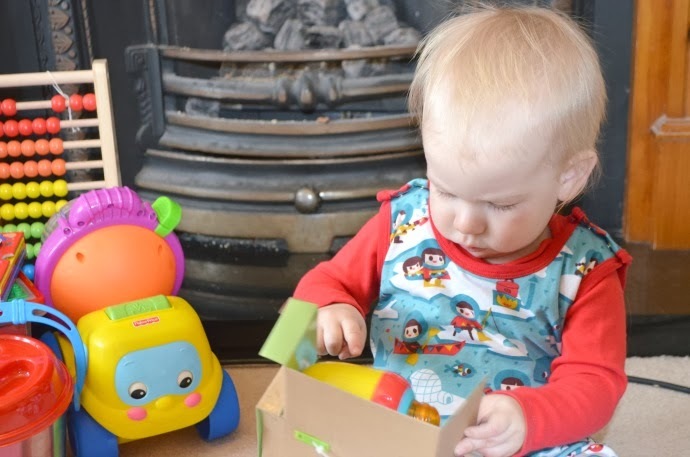 He is a happy boy, sometimes all smiles and sometimes with a constant frown of concentration on his little face, but he is content to play by himself, he loves being out and about and is quite a chilled little dude. He is taking a few steps between people and is desperate to be off, but properly walking is still a little way off. He is super speedy on his hands and knees though and should you accidentally leave the front door open, he will be half way down the front path before you have a chance to blink! He is a natural climber and scales the stairs, sofas and beds with no problems. His favourite trick is to climb up onto the sofa and try and get over the back at the moment too. Thankfully he learnt how to get down safely a while ago too, and has mastered climbing off as well. Archie is cheeky, you can see it in his eyes and in his smile. If you tell him not to do something, he turns round, flashes though six little white teeth and then goes back to exactly what he was doing. He is determined, and does things in his own time. He doesn't wave or clap - not can't but doesn't. He has done both, but chooses not to and the health visitor confirmed at his one year check that this was him showing who is boss. I am going to have my hands full with this one! 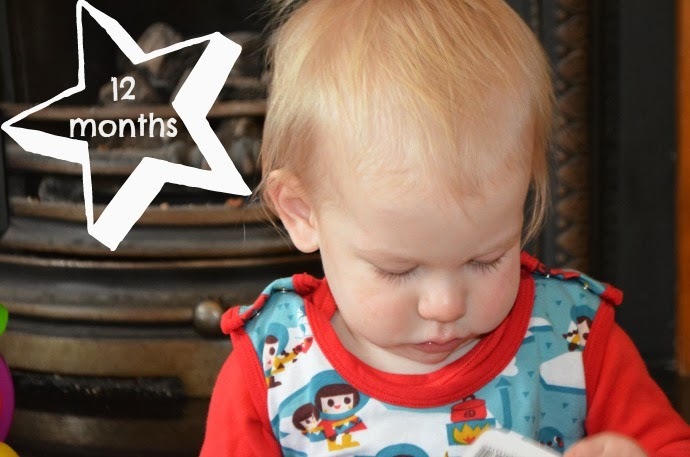 At 12 months, Archie is still breastfed. He always feeds first thing in the morning and last thing at night, but if we are at home he will sometimes have an extra feed in the middle of the day too. It is nice not to be feeding out and about anymore as my pretty winter dresses can come out of hiding and but I love curling up with him at the end of the day for a quiet feed. He loves his solid food too though, especially pasta, raisins and pears. Sleep is still not settled but he usually either sleeps through or wakes once around 5/6am for a feed before going back down until around 8 when we get up. I have been doing a sleep study with Kiddicare and it has been really interesting to plot his sleep and see any patterns. Daytime naps are not scheduled, and he has one every day lasting anything from 10 minutes to 2.5 hours. It doesn't seem to affect his mood though and he can cope fine on only 10 minutes sleep it seems (I can't!). Dylan and Archie's relationship is definitely changing as Archie is getting bigger and stronger and they haven't been getting on as well as before now that Archie wants to be in the centre of everything. They still have times where they play nicely together or alongside each other, but often they only want what the other is playing with which gets very frustrating for us all! When they do play nicely though, they are such a joy to watch. They play peekabo and they chase each other around, giggling together the whole time and I know this will get even better as they grow. 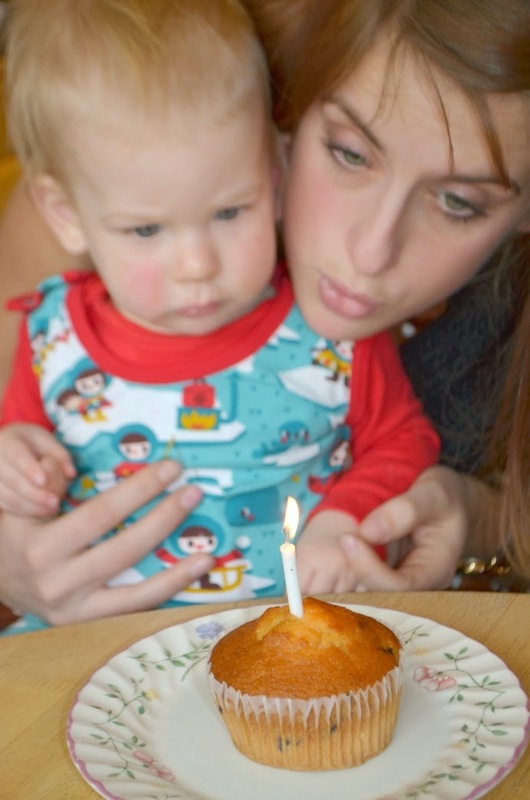 Archie's first birthday party was lovely and we had a hungry caterpillar party which everyone seemed to enjoy. His actual birthday was much quieter as we were all feeling a bit run down and snuffly but we went out for a walk and lunch and spent the day seeing family. It has been a year since Archie's arrival turned our family from a three to a four. A year of change, of smiles and laughs, of tantrums and tears. 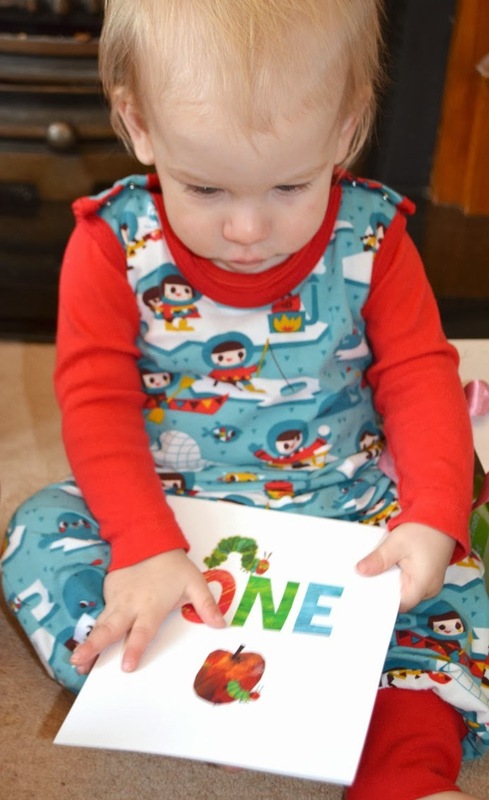 A year of learning for us all - how to be a brother, how to juggle two children, how to pack a nappy bag for two, how to get a double buggy on the bus, how to do solo bedtime with two children and how to alter our routine so that it works for us all. Parenthood is a constant learning curve and I know this is only the beginning, but we love being a family of four.